The World Geography map only shows the distribution of the earth's natural landforms on the surface of the globe. Map depicts both the earth's physical features and the human phenomena on its surface that is the result of man's interaction with his physical environment. The World Geography map therefore not only shows the distribution of the earth's natural landforms on the surface of the globe but also depicts the elements of human intervention such as political boundaries and the division of the world into countries and independent states together with their capitals and principle cities. As far as the earth's physical features are concerned, the World Geography Map shows the distribution of the varied natural landforms and topographical features of the earth's surface on a global scale. The spectacular variety of man's natural environment is due to the diverse physical landforms on the surface of the globe ranging from mountains, highlands, plateaus, canyons, valleys, plains, deserts and glaciers to oceans, seas, gulfs, bays, underwater trenches, rivers, lakes, forests, deltas, islands, peninsulas, and coastal landforms such as fiords, coral reefs and capes and promontories. The World Geography Map therefore depicts the main features of elevation and depression on the earth's surface and is also the most graphic representation of the earth's various contours and its most prominent physical features. 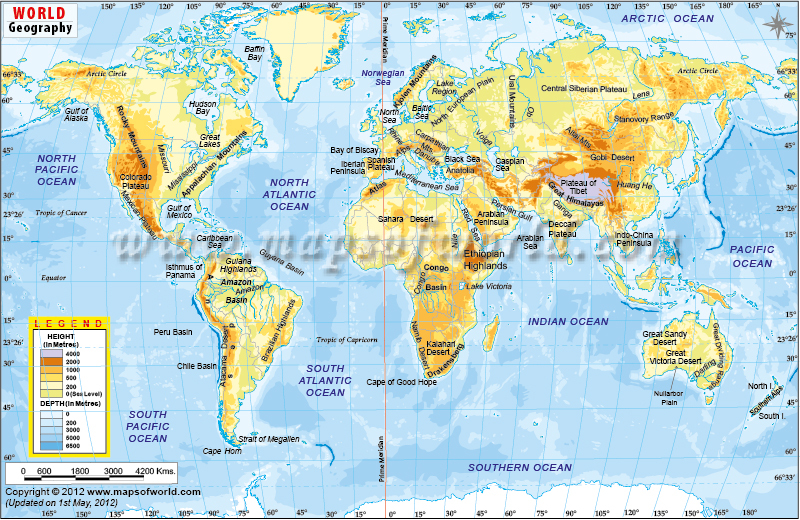 The World Geography Map also shows the boundaries separating the various countries and other political entities of the world including their land borders and maritime boundaries. The territorial waters of the countries with coastlines and islands are also clearly marked in the World Geography Map. The division of the world into separate political entities is marked by their political boundaries. Some of such boundaries may be natural such as mountains and rivers while others are politically demarcated. Some of the boundary demarcations are agreed upon by the countries that share those borders and are recognized internationally. But there are some borders that are a subject of continuous dispute. Border disputes may extend over land, water or maritime boundaries and over possessions of such features as watersheds, islands, territorial waters and Exclusive Economic Zones. What is The Capital of Kazakhstan? What is the McMahon Line? What is One China Policy?